From early times, the boundary between the parishes of St Helens and Newchurch (which pre-1866 included Ryde) was marked by Monkton Mead which flows alongside the railway track from Smallbrook north to a point where they both disappear into separate tunnels under Ryde Esplanade. The tunnel containing Monkton Mead actually runs underneath Cornwall Road. 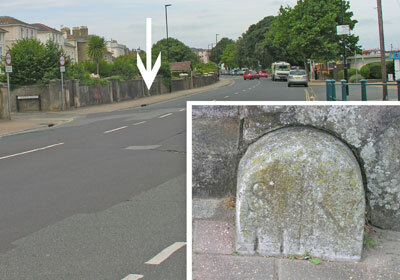 Easily overlooked on Ryde Esplanade, almost opposite Cornwall slipway is one of the old boundary stones up against a gate pillar and sunken into the pavement. On the left is marked St H, and on the right N - thus marking the boundary between the two old parishes. Two streets back, in Simeon Street, is another marker - possible these were the only two markers needed as elsewhere Monkton Mead flows on the surface.